Indoor grand piano available for play weekday mornings (09:00 - 12:00). 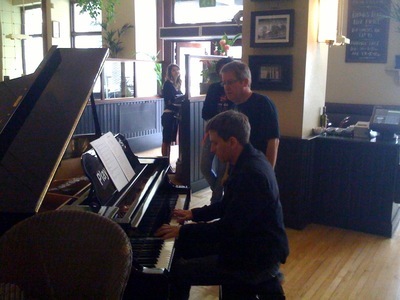 Hey kev p - did you get to the pianos at Brown's, and did you enjoy it? I arrived six minutes before (their ) closing on my 21st piano.... alas too much piano had taken place that morning...today.. so I had the photo op'... but was kindly invited back for another (earlier ) breakfast go tomorrow ! D-n-K's Piano Dash took place on 7 July - All 30 pianos played across London in the space of just 12 hours! Tracks from the album No XCUSES were played and funds were raised for the Help for Heroes charity. Please visit www.d-n-k.co.uk.